Before we proceed to making this simple and delicious dish, let’s clear up a couple of confusing points. Here in Spain, a “tortilla” is an omelette. It has nothing to do with thin wraps of unleavened bread. Those are Mexican tortillas. Secondly, an omelette pure and simple, consisting of nothing more than beaten eggs, is known as a “French omelette” (tortilla francesa). Much more substantial, with chunks of potato, is the meal we are about to prepare – the Spanish omelette, or “tortilla española”. This filling dish is nothing if not versatile. It is delicious hot from the frying-pan, but can also be kept and eaten cold. 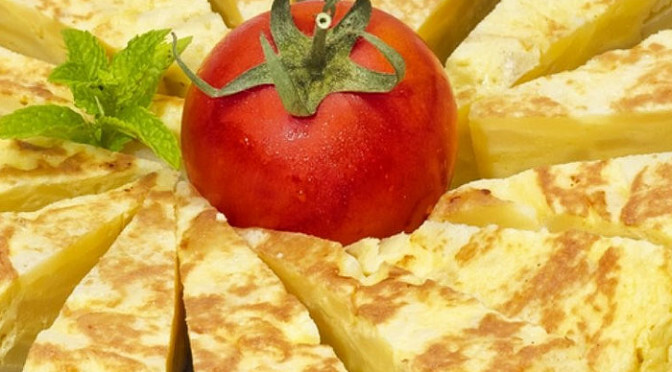 A “wedge” of tortilla española makes an ideal snack or starter, and it can be complemented with salad, fish or just about anything. Peel the potatoes and dice them into cubes (this is very much the traditional way to prepare them). Get the olive oil very hot, then add the potato cubes and the onion. It is important to make sure that the potato pieces are completely sealed by the oil. Reduce the heat slightly, and cook the potato until the cubes turn golden. This should take about fifteen minutes. Once the potato cubes are soft and cooked through, drain off the oil, save it, and place the potato in a bowl. Now beat the eggs, adding salt, and when they are evenly mixed, add this to the potato cubes and stir thoroughly. The retained oil can now go back into the frying-pan. Heat it up again, then add the mixture of potato and egg. Really, you are making a standard omelette now, so do as you would normally do – keep freeing the outer edge of your mixture, using a spatula, and ease any uncooked mixture towards the outer edges, where it will get more heat. Don’t let the omelette brown too quickly. Now comes the fun part. The upper half of your tortilla española is not cooking as rapidly as the underside, so you now have to turn it over. When you’re sure that it is no longer too runny, place a plate over the frying-pan and (holding the plate, of course!) flip the whole thing upside-down. If you’ve done it reasonably deftly, the omelette will pop neatly onto the plate. It’s a simple matter now of sliding it back into the frying-pan; with the well-cooked side on top! Return it to the heat, and very soon the whole tortilla española will be evenly cooked, and ready to serve. A visit to the Ronda area, Nature, Coffee, Churros and Gazpacho!